The bodies of two teenage girls — believed to be close friends at Brentwood High School and the victims of a “brutal attack” — were found in the community a short distance apart over a span of less than 24 hours, Suffolk police said Wednesday. Police said the body of 15-year-old Nisa Mickens was discovered Tuesday night by a passing motorist. The following evening, there was another shocking discovery: a body matching the description of Nisa’s missing friend — Kayla Cuevas, 16. Police said both victims appeared to have been beaten. No arrests had been made late Wednesday. The grim news stunned the community, with grieving friends and family members gathering on street corners to console one another. An autopsy by the medical examiner’s office found evidence of lacerations and head trauma and determined the cause of death to be “homicide by assault,” Sini said. Information on the other victim’s injuries was not disclosed by police. While a positive identification hasn’t been made, homicide Det. Lt. Kevin Beyrer said the Cuevas family had been notified. Beyrer emphasized that the investigation is in its early stages, but said the girls probably were together when they were beaten. “It appears they were both killed where they were found,” he added. Detectives worked late into the night trying to piece together what happened. They are looking into whether the girls were grabbed as they walked on the street and probing possible motives, including whether the homicides are gang-related. Sini said only that there are “some indications there was gang involvement” in the attack. Nisa’s body was found on Stahley Street at Ray Court in Brentwood at about 8:35 p.m. Tuesday. The second body was found at 5:14 p.m. Wednesday in a wooded area off Ray Court, police said. Beyrer said a woman who lives near the woods saw the body and called 911. Police had been searching the area with cadaver dogs and helicopters. Kayla was with Nisa before she was killed, Sini said, and earlier in the day investigators encouraged anyone with information about Kayla’s whereabouts to come forward. Police posted a $5,000 cash reward for information leading to the arrest of the killer or the safe return of Kayla. 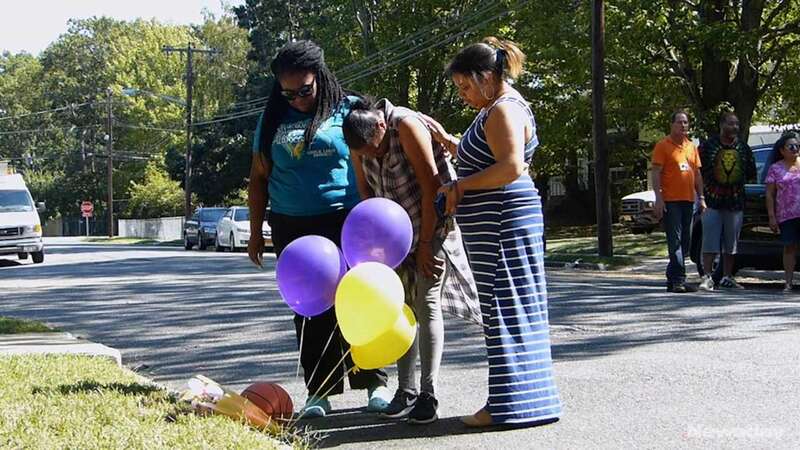 On Wednesday, Nisa’s parents, Rob Mickens and Elizabeth Alvarado, visited a makeshift memorial on Stahley Street that had been decorated with flowers and balloons. Mickens said his daughter had gone to visit Kayla and texted him around 8 p.m. Tuesday asking to be picked up later. Mickens said he went to get his daughter, but she wasn’t there. He said he called her cellphone, but got no answer. He left a basketball at the memorial, recalling how his daughter loved the game and often wore a basketball jersey. Nisa was thinking of becoming a nurse or veterinarian, her father said. “Already she had her goals set,” he said. Alvarado said Nisa didn’t want much for her birthday — just three balloons, brought to her school. The bubbly teen loved snacking on Doritos and cinnamon buns and had conquered her fear of roller coasters during a recent trip to an amusement park, according to Stefanny Fernandez, a close friend. “She had a bright future — everything going for her,” said Fernandez, 24, of Central Islip. “With a heavy heart,” Brentwood schools Superintendent Levi McIntyre sent a letter to parents Wednesday informing them of the grim news. Outside the home of Kayla’s family, more than a dozen friends and neighbors gathered Wednesday night, some hugging, others crying. The girl’s older sister was taken away in an ambulance, apparently overcome with grief. “Everybody’s mourning,” one youth said. Kayla’s parents were too distraught to talk, friends said. Suffolk County Legis. Monica Martinez, who represents Brentwood, said she knew both girls when they were at East Middle School, where she had been an administrator. “They were good girls, always together, rambunctious,” Martinez said at the crime scene. “There are no words for how I feel in my heart. We have to come together as a community,” she said. A group of the girls’ friends gathered at one corner and said they learned of Nisa’s death when school officials announced it over the loudspeaker and asked students to bow their heads for a moment of silence. Later they learned through social media that another girl’s body had been found. One of Nisa’s 11th-grade friends said the teenager called her about 7:30 p.m. Tuesday to ask her what she was doing. Nisa and friends had planned to go out to a restaurant Saturday to celebrate her Sweet 16, the friend said.